Tales of Cyprus is my personal crusade to investigate my ancestral home Cyprus, as it existed before 1950. Through a series of original drawings, interviews, stories, and photo reproductions I am seeking reveal a way of life that was rich with tradition and cultural identity. For example, before 1950 Muslims and Christians coexisted in relative harmony, families stuck together, community engagement was strong, children played outdoors, people ate what they produced and nearly everybody was somehow more content and grateful with what little they had. It was apparent that Con’s parents and their generation would be the last witnesses of this authentic cultural landscape and lifestyle that was Cyprus. So Costas, tell me about ‘Tales of Cyprus’? What is it about? Well let me begin by stating that Tales of Cyprus is my cultural art project that seeks to explore my parent’s homeland of Cyprus, but Cyprus, as they knew it. In other words, I am only interested in the way Cypriots interacted and coexisted during the first half of the 20th century. With Tales of Cyprus I hope to present a contrast between the past traditional society and the present modern society. I hope to explore lifestyle, living conditions, working environment, health and diet, education, leisure, recreation, community, family unity and much more. So you see, Tales of Cyprus is therefore, a tribute to a bygone era. What is the contrast between the past and the present? Okay, well take for instance, today’s obsession by many people who prefer to use social media and so-called ‘smartphones’ to communicate and converse with others and then compare this obsession to the ancient act of communicating in person, or by sending hand-written letters or postcards. Or compare the sustainable, organic sustenance of home-cooked food with the highly processed, manufactured food we are forced to eat today. Where did the idea for Tales of Cyprus come from? One fateful day in the summer of 2010, I was walking through the food market of a local shopping centre when I noticed a large, overweight family feasting on a bucket of fried chicken. What shocked me was that each member of this family seemed hypnotised by some sort of hand-held device. They sat silently, ignoring each other, transfixed by the gadget in their plump little hands. Later that day I went to visit my father for our weekly catch-up over Turkish coffee and my mother’s koulourakia. I mentioned the shocking scene at the food court to my father. He shook his head and lamented the fate of modern society and modern living. We spent almost three hours that day, comparing the past with the present. He spoke about life in Cyprus, in his poor village growing up in the 1920s and 30s. I was transfixed. I went back a few days later and conducted a proper video interview with my father. The seed of an idea was now forming in my head. I decided to record the living memories of Cypriots like my father before it was too late. My father had just turned 89 years old. I was lucky his mind was still alert and his memory of the past still accurate. By the end of 2013 I had conducted close to 20 interviews. Tales of Cyprus was born. Tell me about the interviews? After I interviewed my father, the next person I interviewed was my mother followed by my aunties and uncles. I wanted to learn as much as I could about life in Cyprus during the first half of the 20th century. I decided the best way was to meet and interview people who were actually there and had lived and experienced that way of life; an eyewitness, first hand report, if you like. At the same time, I started searching for any old ‘original’ family photos that belonged to my parents and relatives; especially photos that were taken before 1950. I started to bring my photo scanner to every house I visited. At this point I still did not know where all this will lead but I knew I had a mission to fulfill. By 2014 I had conducted close to 35 interviews in Melbourne alone. This was indeed a race against time. Many of the people I had hoped to interview have died or are developing Dementia. What did you discover or learn from all your interviews? The interviews I have conducted yielded valuable information and proof that we, as a society, although richer in material wealth were poorer in so many other ways. As I said earlier, I discovered that my parent’s generation, although a lot poorer than my generation, were somehow more grateful with the little they had. I discovered that children played outdoors and did not suffer from obesity, anxiety, social phobias, depression or any of the addictions and allergies that have dogged our modern world. I discovered that people generally lived off the land and survived on what they cultivated or farmed. I discovered a world where sustainable living was the norm. I discovered that Turkish and Greek Cypriots were not only friends but coexisted as brothers and sisters. I discovered that Cyprus may be at risk of losing its cultural identity and that my parent’s generation will be the last to have lived a more traditional way of life. I also discovered that the rest of the world has also lost its innocence and authenticity due to our mad obsession with shiny gadgets, processed food, capitalism and globalisation. We eat more today than any previous generation and we move less than any previous generation. We live in a 24-hour food cycle where we won’t allow ourselves to feel hungry. It’s no wonder that most deaths in our modern era are diet-related. Tell me about your art. What inspires you? Once I started interviewing elderly Cypriots and scanning old photos, I decided to create a series of drawings that would help to visualise the Cyprus I had discovered through my research. I began to buy books that had old photos of Cyprus and collect anything I may be able to use as reference. I was inspired by many artists who belonged to the ‘golden age’ of illustration such as… In 2014, I spent a total of 32 sleepless nights creating 12 pencil drawings and 12 digital paintings that I hope would showcase and encapsulate the Cyprus of yesteryear. In December that year I launched my Tales of Cyprus exhibition in Melbourne showcasing my artwork, my photo reproductions and of course the stories behind the photos. Over 1000 people (many from the Cypriot diaspora) came to see my exhibition. Following the success of the Melbourne show, I was invited by the Cypriot Community of South Australia to bring my exhibition to Adelaide. Once again, the response from the viewing public was very positive and encouraging. I have since conducted many public talks to audiences both large and small regarding my Tales of Cyprus project. Who is Tales of Cyprus for? Who is your target audience? I imagine that people of all ages will benefit and learn something from attending one of my Tales of Cyprus exhibitions. Younger members of the audience wll be able to compare their life, as it exists in today’s digital age with that of the people represented in the exhibition who are from a completely different time and place. Their comparisons will certainly provoke questions (and hopefully answers) about the gains or losses of modern society. This exhibition will obviously resonate on a personal level with Cypriots everywhere since the general themes expressed throughout the exhibition deal directly with a shared and familiar cultural heritage and a way of life that remained relatively the same for generations up to about the 1950s. For the older members of the audience they too will enjoy and reminisce past lives when they see photo reproduction and artwork that reminds them of a bygone era and way of life that has all but disappeared. In fact, most members of the audience should will be able to make stark comparisons between the way they live today and the life experienced by previous generations such as their parents and grandparents. Most people will ultimately receive an education about the value of traditional living such as living off the land, eating non-processed, chemical-free foods as well as learning about the lost art of communication. Why are you searching and looking for old photos? Well to put it simply, they are rare and beautiful. These photos evoke a beauty in photography rarely seen in today’s selfie-obsessed digital world. The photographs are testament to the craftsmanship and creativity that once existed with analogue photography. Everything about these old photos evoke a time and a place that is now forgotten or no longer exists; from the dry plate camera techniques employed by the photographer to the use of makeshift backdrops and clever lighting effects. From the clothing worn by the person/s in the photo and the way they are posed to the tone and patina of the image itself. More importantly the photographs are a rich visual representation of this bygone era. They open the door to the memories and stories of that generation and their world. I believe we have so much to learn from these snapshots into past lives. The photos have been lovingly curated over many, many years and one of my goals is that they are not lost to future generations. I want to bring them back to life and preserve them. I’m proud to say that thanks to Tales of Cyprus I am starting to build a rich archive of rare black and white photographs that I have already scanned from family albums. What are the main themes covered or explored with Tales of Cyprus? The main themes are migration, identity, cultural heritage, homeland, ethnography, oral history, storytelling, vintage photography and so much more. Take migration for instance. With Tales of Cyprus I aim to highlight how many Cypriots who migrated to Australia (like my parents) have managed to maintain strong links to their former homeland through storytelling and by successfully upholding and preserving their customs and traditions. In many ways, these migrants have perhaps been more successful in preserving old customs and beliefs than perhaps their relatives back home. Tales of Cyprus is also a story about adaptation, preservation and loss. How my parents and their generation were able to adapt to a new life in a new land. How they managed to preserve their culture. You mentioned how you believe our society today may be richer in material wealth but perhaps poorer in so many other ways. What do you mean by that? I mean after conducting over 32 interviews, I have come to believe that my parents’ generation were more content and definitely more grateful with their lot in life than say, my generation. Although they were poorer and had a lot less, they were grateful. We may think we have evolved into a more civilised, intelligent species with our fancy cars and fancy houses and our flat screen TVs and multitude of gadgets. I question, though if we are truly content and grateful. Take for example the way we connect as a family. More often than not, we live in great urban environments that hide and separate family members. The sheer geography keeps us apart from loved ones. We become disconnected and therefore disengaged. We lack family unity and support but also community unity and support. It’s a far cry from the rural peasantry culture that existed in the village. My research has shown that the child was indeed raised by the village and the village looked after their own, especially the elderly. Today, so many of our frail and elderly family members are dumped into nursing homes to be cared for by strangers. I realise that ‘dumped’ may be a very strong term, but I have witnessed many elderly Cypriots who are slowly dying alone and depressed in these places. Tell me, how do you spread the word about this project? How do you promote Tales of Cyprus? Like many other artists today, I use the Internet and social media sites such as Facebook to inform the world about my creative process and current plans. I have designed and created a website that acts like a shopfront presenting the main facts and background information behind this project. As a professional designer and artist I am fully aware about the importance of marketing myself as a brand. Brand identity must be consistent and compelling in order to attract attention. I have therefore created a consistent design identity for Tales of Cyprus to help promote and market it to the world. Almost from the start of this project I created a Facebook page and started posting interesting facts, stories, old photos and examples of my artwork. I realised that in order to attract more ‘likes’ and attention from the Facebook community I had to adopt a routine of posting something interesting every few days. In the space of 18 months my Tales of Cyprus page on Facebook has attracted on average about 50 new ‘likes’ every week and today I can boast over 3300 likes. My design skills have allowed me to design and produce everything required for marketing and publicity including, booklets, brochures, flyers, posters, large banners, tabloid newspapers, magazines and much more. 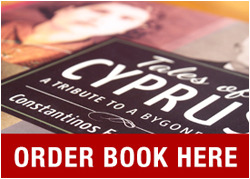 Everything I have designed and produced has the distinctive Tales of Cyprus treatment and brand. It’s like a well-oiled machine that adds credibility and integrity to the project. My promotional tools have also helped to validate my efforts as an artist / designer. By doing it all myself I have been able to curate my own exhibitions and save thousands of dollars in the process. What are your plans for this year or beyond? In October this year, I am planning to travel to Cyprus to continue my research. I hope to visit many towns and villages to interview the elderly residents there. Once again, I will be searching for subjects who were born between 1915 and 1940. At the same time I am hoping to find and scan old photos from the same time period and record their stories. I am also hoping to be invited to present my project as a public talk for interested people, artists and students. Another reason for this trip is networking. I am hoping to meet likeminded individuals who can help me bring my Tales of Cyprus exhibition to Cyprus in the not-to-distant future. So you DO intend to bring your exhibition to Cyprus one day? Yes, that’s the big plan. My ultimate goal is to secure funding and a suitable venue to be able to bring my exhibition to Nicosia or perhaps organise a travelling show that tours around the island. That would be amazing. Any plans for a book perhaps? Lots of people keep asking me that. You never know. I’m a graphic designer by profession so I relish the opportunity to design and publish my own book. I can envisoge a large, hard-bound coffee table book chock full of amazing stories, recollections and memories as well has high quaity reproductions of the photographs I have collected and of course my own illustrations and art. As far as I can tell, no one has produce such a book before. It would be a world first and a dream come true for me. Lastly, how can people find out more about this project or get in touch with you?